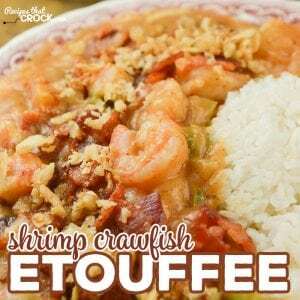 Shrimp Crawfish Etouffee - Recipes That Crock! Are you looking for a Homemade Shrimp Crawfish Etouffee Recipe? Our from-scratch recipe is a seafood lover’s dream! Have you ever had a hankerin’ for some a really GOODe seafood dish? Me too! We recently went on our first LONG RV trip to Texas and made a two week stop in Galveston. I knew that bein’ right on the gulf I was sure to find some delicious dishes made with crawfishes and I was right! There’s a little joint called Benno’s On The Beach and they had the absolute best crawfish etouffee I have ever tried. I knew I had to take the flavors home and try out my own spin on this delicious dish. Many GOODe cajun/creole dishes start with a roux, which is simply the cooking of flour in a fat. Now, some folks say that you can’t make a better roux than with butter while others say that it’s too risky as butter burns easily and you should use oil. I decided to take my chances and even doubled my risk by combining butter with some rendered bacon grease that we had left over from a batch of bacon from earlier in the day in our air fryer. It added not only a buttery flavor to the roux, but a bit of a smoky flavor as well…not to mention bacon. Y’all know that bacon goes with everything, right? This dish also allowed me to test out cooking rice in our Instant Pot and it was a success!!! Combine flour, butter and bacon grease in a large skillet to make a roux. Place rinced rice and water into the Instant Pot and cook for about 6 minutes. Add crawfish and shrimp into your trinity/roux mix. Cook until shrimp is pink. 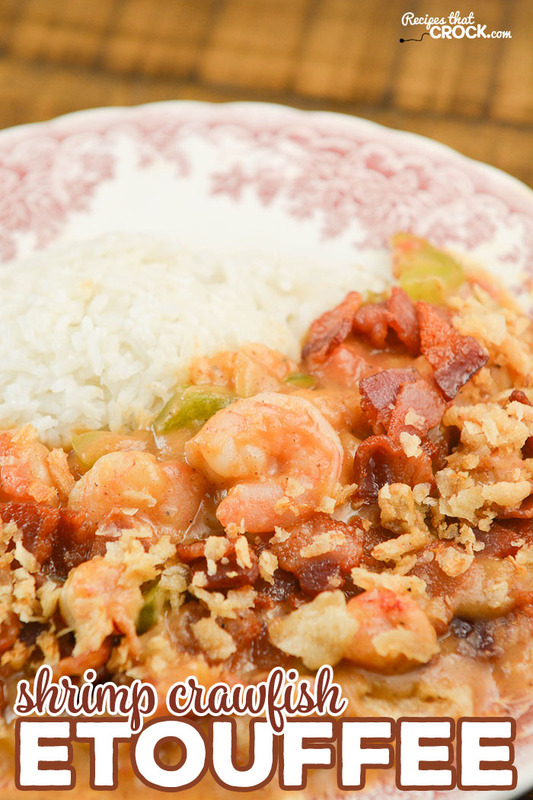 Serve etouffee over or beside your rice and garnish with crumbled bacon and french fried onions. Adjust level of cajun/creole seasoning to make etouffee as hot or mild as you would like. All electric pressure cookers cook differently, so cooking times are always a basic guideline and should always be tested first in your own electric pressure cooker and time adjusted as needed. Adjust level of cajun/creole seasoning to make etouffee as hot or mild as you would like. As with any of our recipes, calorie counts and nutritional information varies greatly depending on which products you choose to use when cooking this dish. All electric pressure cookers cook differently, so cooking times are always a basic guideline and should always be tested first in your own electric pressurecooker and time adjusted as needed. 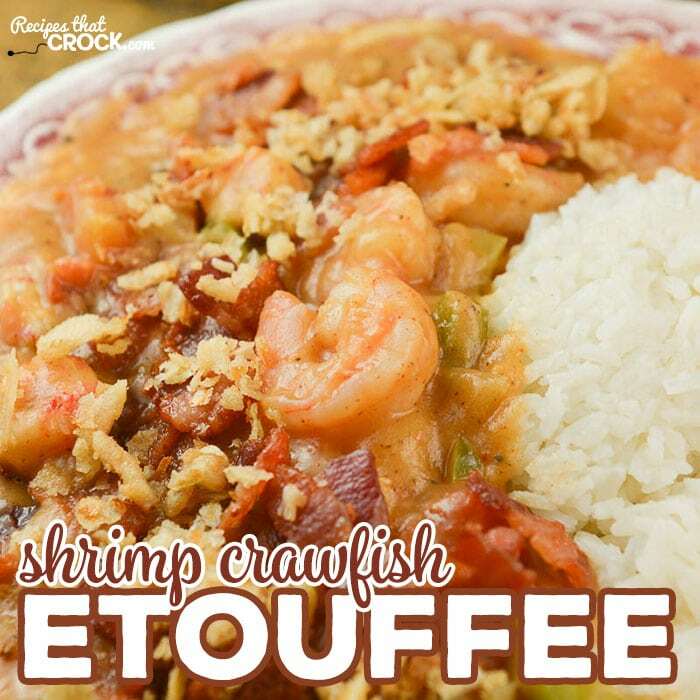 Are the crawfish tails peeled in the shrimp-crawfish etoufee? What is an instant pot? I love your recipes and make them often.